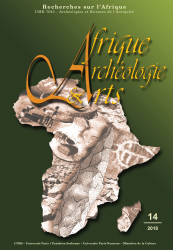 Afrique : Archéologie & Arts is a peer-reviewed journal dedicated to African archaeology and arts, published on a yearly basis. It speaks to the diversity of ancient cultures from the continent, building on related disciplines (geomorphology, archaeometry…), and giving priority to the methodologies of Art history for the study of artistic productions. Launched by the team Afrique – current research theme of the team Ethnologie préhistorique – (UMR 7041 - CNRS), it gathers original research, syntheses, thematic issues as well as abstracts of recently defended theses of high quality. The texts – in French or in English – are accompanied with an extensive iconographic documentation. Afrique : Archéologie & Arts is published both in hard copy and in electronic copy. The former issues will be soon available online. Dijon, Les Presses du réel, 407 p.
Montpellier, Presses universitaires de la Méditerranée, coll. Mondes anciens, 276 p.